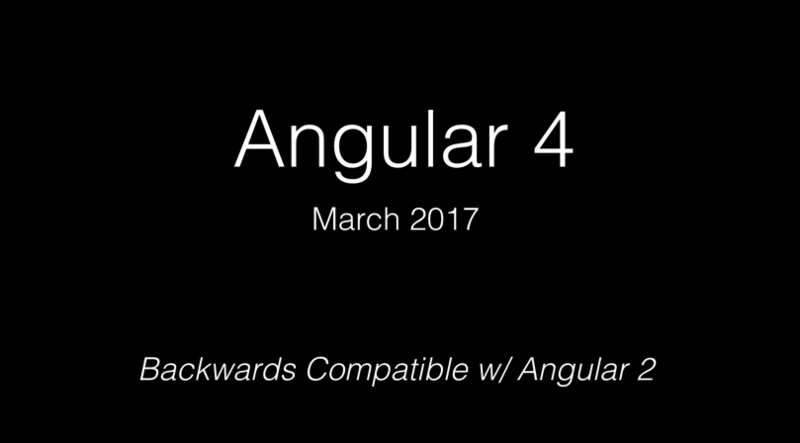 Igor Minar, lead dev on Angular, announced that the successor to Angular 2 is going to be Angular...4? What the heck is going on? This article has been cross-posted on the official Angular blog . Thanks to Igor, Brad, Stephen and the whole Angular team for the in depth review of this article. This once more shows how much their care about community work. Back in September when the , the Angular team also announced they will switch to Semantic Versioning (SEMVER). "A breaking change happens whenever you as a developer and consumer of a library, have to step in and adjust your code after a version upgrade." Just to be clear, as Igor mentioned in his talk, even just upgrading Angular’s TypeScript dependency from v1.8 to v2.1 or v2.2 and compile Angular with it, would technically cause a breaking change. So they’re taking SEMVER very, very seriously. People that have been following the Angular community for a while, definitely know what I’m talking about. We went from Angular 1 to Angular 2, and it was a total breaking change, with new APIs and new patterns. That was obvious: ultimately Angular 2 was a complete rewrite, even though there are upgrade options for you available. Changing from version 2 to version 4, 5 won’t be like changing from Angular 1. It won’t be a complete rewrite, it will simply be a change in some core libraries that demand a major SEMVER version change. Also, there will be proper deprecation phases to allow developers to adjust their code. Internally at Google, the Angular team uses a tool for handling automatic upgrades, even of breaking changes. This is still something that has to be planned in more detail, but the team is working hard on making this tool generally available, most probably in 2017 in time for Angular 5. @toddmotto@manekinekko@jdfwarrior@schwarty but please don't call projects ng2- or angular2-, etc. All the docs — even for Angular 1 — will be aligned to this in the coming weeks. Yes, they’ll be dropping “JS” from AngularJS where possible. Also in blog articles, courses, books or whenever you are targeting a very specific version of Angular, consider adding a header line which states that "This articles uses Angular v2.3.1." Why was the router even at version 3 already? Here is the official announcement of the Angular team when they released v3 of the router. So you can see that major versions will be released approximately every 6 months. We do need to evolve Angular in order to avoid another Angular 1 to Angular 2 change, but we should do it together as a community in a transparent, predictable, and incremental way. Thanks to Igor, Brad, Stepehn, and the whole Angular team for reviewing this blog post. This once more shows how much their care about community work.